Thanks, I'll check the links. I did some looking and found a couple bigger shells, one is around 1.25 and he is checking it out now. Hopefully he'll switch and I can see how well it fits so I can order the right sizes. To me it looks as if that guys shell has about a 1" opening, give or take. I would say a shells between 1 1/8 & 1 1/4" openings would probably be best. I have found decent shells on eBay although they are listed by size rather than opening size. You need to use the shell project chart to determine what you need. Just find the shell type you are looking for, then use the chart. Just use the black line, the other colors and dots make it confusing. He’s helping you hold the tape measure! So cute! I agree with Motörcrab's sizes. Going from a Murex to a Turbo will give tons more interior space, so he won't need as huge of a shell as you might think. He didn't move into the tapestry shell last night, was really hoping he would before he goes down. I did order a couple new turbos, maybe he'll like one of them better. Thanks for help. I found that boiling the shells in saltwater and leaving a little inside the shell sometimes helps to entice them. 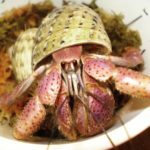 Just be sure the shells and water are completely cool before putting them in the tank and be sure to use the same mix you use for their water, dechlorinated and Instant Ocean or similar. Not table salt. Be careful when boiling with salt! It can remove the polish from finished shells. We've had people ruin pot-fulls of brand new additions by doing so. I had no idea that happens! What exactly happens to the shell? I'm assuming the outer part of the shell turns white from the salt attacking the polished areas? I guessing that's why they recommend boiling for 2-3 minutes at most. Yeah, it doesn't make a whole lot of sense, but it's happened several times so I like to warn about it. I once sold a lot of shells to a guy a few years back and he sent me pictures after he had cleaned them, he had boiled all of them with instant ocean for about five minutes and they came out white, rough, and pitted on the outside and inside. For whatever reason it can strip the natural coating, it might even be a reaction between the pot and the sodium and the calcium. I totally dunk shells in saltwater after they've boiled and cooled, I think it really helps get the crabs interested. And I have forgotten pots of shells on the stove and let them boil nearly dry so it shouldn't have to do with the length of time.